Not since Joe Cocker belted his "With a Little Help from my Friends" at Woodstock have I come across another performer so electrifying on stage you're left breathless. You can't get enough of him. 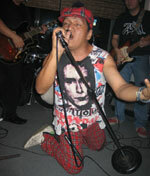 Meet Romeo Lee - rock star, artist and a proud member of the UP Mountaineers! The word goes around UP that you're not really a bonafide student yet until you meet Lee. Yes, he is a university icon and dearly loved by the student orgs, the frats and what have you. Putting it plainly, he rocks! UP has always had its icon...and we all love them like the Brits love their eccentrics. Back in the day, THE MAN was Danny Purple. Already in his mid fifties then, he would still flash his student ID to get a discounted jeepney fare - that's if he feels like paying. Moreover, he would simply tell the bus conductor that he is "CRIME"...and 'crime does not pay'. Ya gotta love the guy! Table hopping in between acts, I found myself with 2 celebrities - newscaster Ces Drillon and political analyst Joel Rocamora. These are 2 people who take on political issues from the ringside seat. I was all ears as they casually talked about the 'what ifs' of the political landscape. Like an impressionable child joining an 'adult' conversation, I picked on their brains asking annoying questions like...who's clean nowadays...who's the real kingmaker...what about the impeachment? They must have been relieved when I left them to catch Lee as he was about to start. The funny thing is, when I told a friend about my chance meeting with Ces, she exclaimed, "Ces is one of the most respected journalists around. I hope she doesn't do something stupid like run for president". Hmmm...the presidency has now become a dirty word...interesting. Well, we live in interesting times.